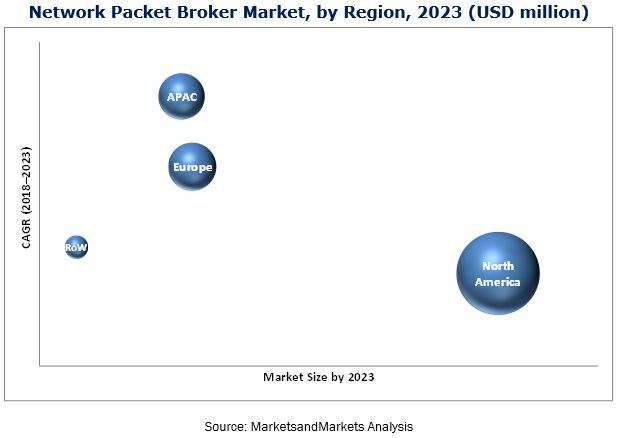 [114 Pages Report] The network packet broker market is expected to reach USD 849.4 million by 2023 from USD 585.4 million in 2018, at a CAGR of 7.73% during the forecast period. The base year considered for this study is 2017, and the forecast period is 2018–2023. The growth of the market is attributed to the need for simplified data center management and automation, high demand for cloud services, and surge in internet multimedia content and web applications. The rising trend of bare-metal switches and growing bandwidth requirements in data centers are the key growth opportunities for the players in the market. However, the presence of self-reliant enhanced servers inhibits the growth of the market. 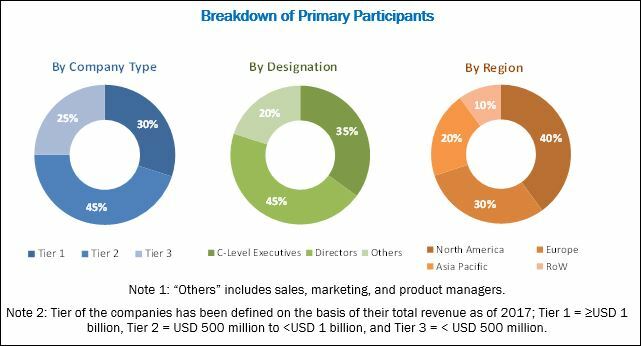 During this research study, major players in the network packet broker market in various regions have been identified, and their offerings, regional presence, and distribution channels have been understood through in-depth discussions. To find the overall market size, top-down and bottom-up approaches have been followed to estimate the sizes of other individual markets by using percentage splits from secondary sources (such as Hoovers, Bloomberg Business, Factiva, and OneSource) and primary research. The entire procedure includes the study of the annual and financial reports of the top market players and extensive interview of industry leaders such as CEOs, VPs, directors, and marketing executives for key insights (both qualitative and quantitative) pertaining to the market. The figure below shows the breakdown of primaries on the basis of the company size, designation, and region conducted during the research study. Major players in the network packet broker system market are Gigamon (US), NetScout Systems, Inc. (NetScout) (US), Ixia (US), VIAVI Solutions, Inc. (Viavi Solutions) (US), APCON, Inc. (APCON) (US), Garland Technology (US), and Cisco Systems, Inc. (Cisco) (US), Broadcom Inc. (Broadcom) (US), Juniper Networks, Inc. (Juniper Networks) (US), Big Switch Networks, Inc. (Big Switch Networks) (US), Zenoss Inc. (Zenoss) (US), Network Critical (UK), Corvil (Ireland), CALIENT Technologies, Inc. (CALIENT) (US), Netgear Inc. (Netgear) (US), and Motadata (US). How are the industry players addressing the challenges related to network monitoring and management? The network packet broker market is expected to reach USD 849.4 million by 2023 from USD 585.4 million in 2018, at a CAGR of 7.73% between 2018 and 2023. Major drivers for the growth of the market are need for simplified data center management and automation, high demand for cloud services, and surge in internet multimedia content and web applications. Of all the major end users of network packet brokers, enterprises hold the largest share of the network packet broker market. Increasing enterprise applications require high-performance connectivity, constant uptime, high throughput, and high reliability to manage a vast amount of data. To address these requirements, network packet brokers are being adopted in enterprises. Large enterprises across different industries have been increasingly adopting the digitization to improve their business processes. Also, the revolutionizing digitization in healthcare, e-commerce, banking, and education is the key driver for enterprise data centers, which will eventually drive the growth of the market for network packet brokers. Among bandwidth, during the current times, the adoption of 1Gbps bandwidth NPBs is declining, relegated to low-bandwidth applications and legacy devices. The most common type of NPBs now is 10Gbps. 10Gbps network packet broker capture traffic from access switch uplinks and aggregation/core switches, which usually run at a speed of 10Gbps and higher. The 1 and 10 Gbps bandwidth network packet brokers are widely adopted across various sectors such as enterprises, telecoms, government organizations, and other service providers. Currently, network packet brokers with high bandwidth are gaining a lot traction in the market. As a result, the prices for 1 and 10 Gbps NPBs have been declining, which drives the adoption of these NPBs for the optimum network development. It is owing to these factor the market for 1 and 10 Gbps network packet broker is expected to hold the largest market share in 2018. There has been continuous increase in demand for network packet brokers, especially in enterprises, owing to the increasing demand of network management. Moreover, factors such as data center monitoring, virtualization and cloud computing have prompted companies to enhance network monitoring for superior network security, thereby fueling the market for NPBs. Enterprises mostly rely on network traffic analyzer solutions to optimize their network infrastructure on a daily basis. Enterprises spend huge amounts of money on network resources to keep their network up and running all the time. This takes up a major portion of their time, leaving them with no time to form new strategies for the efficient use of network resource. Network packet brokers provide an effective way to manage and analyze the entire network, centralize, virtualize, and provide real-time applications and bandwidth management of the network to deliver critical business applications at a high speed. Globally, the need for service providers is increasing at a rapid pace. Service providers comprise telecom, managed service providers (MSPs), internet service providers (ISPs), and cloud service providers (CSPs). These service providers use network packet brokers to manage, analyze, and optimize the entire network infrastructure. Nowadays, a vast amount of data are being delivered in the electronic format, and government agencies and departments are striving for a fast and reliable technology to process their data. The government sector is looking for a secure, reliable, and high-performance network connectivity at a low cost. NPBs have many applications in the government sector, which include flexible, scalable, on-demand resource optimization. NPBs offer the government sector a rapid disaster recovery from network failure, remote configuration, cybersecurity, and protection of critical network infrastructure from cyberattacks. However, the presence of self-reliant enhanced servers inhibits the growth of the network packet broker market. Compatibility with the architecture of different data centers poses challenges to the market players. Companies profiled in the report are Gigamon (US), NetScout Systems, Inc. (NetScout) (US), Ixia (US), VIAVI Solutions, Inc. (Viavi Solutions) (US), APCON, Inc. (APCON) (US), Garland Technology (US), and Cisco Systems, Inc. (Cisco) (US), Broadcom Inc. (Broadcom) (US), Juniper Networks, Inc. (Juniper Networks) (US), Big Switch Networks, Inc. (Big Switch Networks) (US), Zenoss Inc. (Zenoss) (US), Network Critical (UK), Corvil (Ireland), CALIENT Technologies, Inc. (CALIENT) (US), Netgear Inc. (Netgear) (US), and Motadata (US). Gigamon (US) held the leading position in the global network packet broker market in 2017. The company offers a wide range of network TAPs, packet brokers, and aggregators for traffic analysis and monitoring purposes. In September 2017, the European Broadcasting Union partnered with Gigamon to strengthen its traffic visibility for faster incident diagnosis and network security. The company has a full product portfolio for network packet brokers, thereby providing a whole range of deployments—from small to very large industries. How network packet broker will impact organization’s network management and optimization? What are the threats/challenges an enterprise can face without the deployment of network packet brokers? *Details on Business Overview, Products, Solutions & Services Offered, Recent Developments, SWOT Analysis, and MnM View Might Not Be Captured in Case of Unlisted Companies.